Burcu Geris is a senior finance executive and an avid believer in the power of education and setting strong role models for women. Named as a Young Global Leader by the World Economic Forum in 2015, she is the Vice President and Chief Financial Officer of TAV Airports Holding, an airport investor operating 14 airports and serving 100 million passengers in the EMEA region. She started her career at Garanti Bank where she worked in Treasury and Project Finance. After joining TAV Airports in 2005, she led the team for financing of several airport deals with a value of USD5 billion as well as helping the company go public and through a major acquisition. 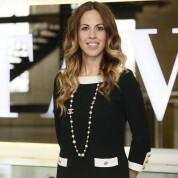 She became the CFO of TAV in 2012 at the age of 34, the youngest woman CFO of a big corporate in Turkey and probably one of the youngest in the world. Burcu believes that by being a role model herself, she can inspire young girls and women in Turkey and around the world that everything is possible. Burcu is active in many women organizations and has been featured in the media for her accomplishments at the young age of 35 in a country and world dominated by men. She was selected as a Rising Talent by Women’s Forum (2013) and was voted Best CFO in Investor Relations in Turkey (2015) by Thomson Reuters Extel Surveys. She is regularly asked to be a keynote speaker at events and conferences in various topics ranging from women in business to infrastructure and finance. Burcu has a Bachelors degree in Business Administration from Bogazici University as well as an MBA degree with honors from Columbia Business School and London Business School. She sits on the boards of TAV group companies and Financial Literacy and Inclusion Association (FODER). She is also a member of Women Corporate Directors (WCD), Professional Women’s Network (PWN), Global Board Ready Women (GBRW) and Global Relations Forum Young Professionals Program. Burcu is married with 2 children. Alongside our parents, teachers are the ones who give us our sense of identity and help us shape our future. I remember my primary school teacher telling me over and over that I can do whatever I put my mind into. I will never forget the values she taught me and the encouragement she gave to break my barriers. Teachers deserve to be celebrated and I am honored to support the Global Teacher Prize.